The ‘Deeside’ training camp is based at Templars’ Park, Maryculter on the banks of the River Dee near Aberdeen. It is aimed at M/W15’s and like the Lagganlia camp takes place around the end of July. There are usually around 16 places for athletes on the camp. The Deeside training camp is based at the Templar’s Park Scout Camp, Maryculter (http://www.templarspark.org.uk/ ). The site is only 8 miles from Aberdeen and is easily accessible from the A93. The Deeside valley is rich in excellent orienteering areas such as Glen Feardar, Cambus O’May, Inchmarnoch, Creag Choinnich etc. Accommodation is in two buildings, the George Smith centre and the White House. Both have a number of dormitories of various sizes and their own showers and toilets. The tour chef prepares all the meals on site and specific dietary needs are catered for. Athletes will be expected to assist with minor chores during the camp. The site is 45 acres in size so there is plenty of room for outdoor games. 2013 was the first year that this site has been used for an extended tour, previously having been used by ScotJOS (The Scottish Junior Squad) for weekend trainings. Although this is the first time that this location has been used for this tour similar tours have taken place since the late 1990’s based at Glenmore Lodge, Badaguish and Lagganlia. The move to Maryculter has been largely prompted by restricted land access caused by the presence of capercaillie and WOC 2015 in the Spey valley. As indicated above there are many top class orienteering areas along the A93 from Braemar in the east to Aberdeen in the west. In addition to those mentioned above there are the areas of Bogendreip, Glen Dye, Scolty and Allt Cailleach all within easy reach of the centre. 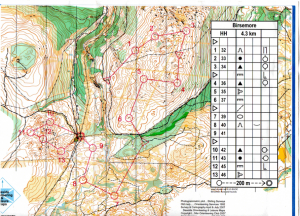 These areas present different orienteering tests to the terrain in the Spey Valley and are seen as a suitable progression for the juniors. The TM is supported by a chef and a Lead Coach. The Lead Coach has a team of up to 8 coaches, providing an ample coach: athlete ratio. Coaches: Roger Thetford, Don McKerrow, Jonny Malley, Chris Smithard, Frances Brown, Charlotte Watson, Mark Purkis, Jenny Ricketts, Zoe Harding. The balance of athletes with about 2/3rds from the first year 16s and the remainder from the second years (most if not all of whom were also on the equivalent tour last year) worked fine, especially since we were based at the Trossachs last year. The majority of the tour was injury free, though there was evident fatigue from following a week of the S6D – mitigated by deliberately having a day off running at the start and some slower moving days thereafter. By the end of the week we had picked up one minor and one more significant ankle sprain, and a recurring knee injury. There were also two athletes involved in a minor car scrape whilst being driven by Chris Smithard –no injury suspected at all. The coaching team had a mixture of experience levels and skills, including three first-time coaches who nevertheless proved invaluable. 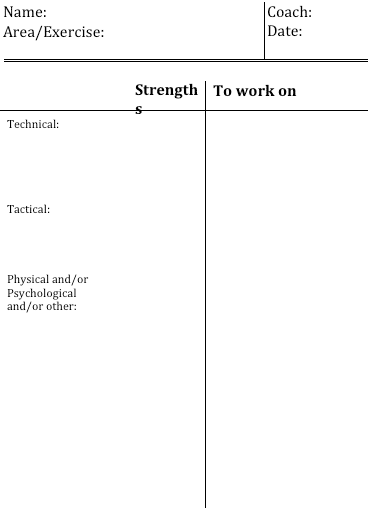 We used a coaching group structure with pairs of coaches taking primary responsibility for generally 5 athletes between them, which also served well to support the development of coaches who worked closely in these partnerships. The coaching groups were designed specifically to mix genders and regions, and with a mind to avoiding athletes having the same primary coach as during a previous tour. The coaches in charge of each team were also primarily responsible for compiling their athletes’ tour reports. These groups were also then used as the basis for duty teams for the week. The duties on the following page worked well, supplemented with additional periodic tasks to clean the bus/showers/toilets/communal areas. A general purpose group for this reason might work well in future, though possibly only needed from part way through. And evening sessions were fitted around this. Less emphasis was placed on debriefs for individuals back at home, as these were generally conducted in the forest. 9 girls in the George Smith Centre (sleeps 8 room) – can use spare sleeps 4 room if desired. 10 boys in the White House: c.5 in the sleeps 6 room, and 5 in the random spare hall. Iain in the White House (sleeps 2 room). Tour tops: “contrast vests” were sourced from . She generally responded to around every second email, but eventual service was both excellent and speedy. Quite wearable customised named tops came to about £9, and I also purchased a number of rather nice medals with GBR coloured lanyards and the engraving “JROS tour champion” for 85p each. Both were well received by athletes. SI equipment was borrowed from Harlequins; GRAMP and Moravian orienteers were most kind in arranging OCAD files and access for us without any charge. My training kites were supplemented by a set of HOC stakes and kites which were used at night (along with Roger’s excellent reflector devices) and for the races. Having my printer available during the tour was extremely useful. The 4 JROS radios were supplemented by a selection from SEJS/GPP/the family Marsden with grateful thanks. A very useful reflective debrief at the end of the week allowed the athletes to decide upon (and share with us) particular points to take away and work on, future goals, and some feedback on the week. These were then incorporated into tour reports. The areas used were fantastic on the whole, with just the presence of some quite heavy bracken in the orange parts of Cambus O’May and as mapped in Scolty’s orange. The tour champs fun relay was abandoned due to inclement weather and a rather long classic race. The effort to support local orienteering by attending a local evening event was one training too much. The outline programme is overleaf. The budget and accounts are shown on the following page. BML printers were duly credited on our tour tops for their continued and valued support, and Turner hiredrive once again supplied vehicles in a highly cost effective manner. We managed with only hiring one minibus due to both Roger and Don providing people carriers. A new system was piloted with upfront charges of £230 for each athlete, which was to be followed by a second charge to cover the actual costs. In fact we were already in surplus, saving each athlete £120 from last year. * Despite the generally long times, Iain's Classic course was much admired by those athletes whom I heard express an opinion. However (my opinion), when so much depends on the route-choice for the long leg, making that decision before having seen any of the open hill made it a bit of a lottery. * Glen Dye was excellent and the Templars Park area was fine for the use we made of it. Cambus O'May also fine (despite a Big Jon Nopesport comment referring to "...rough forest like Cambus O'May"). Having lent out both my big light and my back-up Petzl, I never got out into Crathes so can't comment on that. Balmedie was great but would have been better with a 1:7500 map rather than a 1:10,000 that appeared to have been shrunk from 1:7500 - particularly for a fast-paced exercise. Countesswells, once finally located, was rather ordinary and was an event too far after evening training on both Monday and Tuesday. Birsemore Hill was again hard work for mass-start / chasing exercises and by the afternoon there was a lot of walking. Gaining height on the walk to the start was an excellent decision, although as it turned out the western track would surely have offered easier going. At Scolty I saw only the last control plus the middle-distance section: tough, but not unreasonable particularly as the early section demanded a relatively slow pace. * With the 6-person trains at Balmedie, hare and hounds (and looking after Jack) at Birsemore, and the Classic race on Friday, I felt a bit isolated from the athletes in my group. Chris of course had gone by then and I'm grateful for the comments from Fran, Jonny, Iain and Mark. Without them I'd have struggled to write the tour reports. * Access to wi-fi at Templars Park would probably have prevented most of the faffing trying to find Countesswells, and if Iain had been able to email Karen Maxwell we could also have had an extra coach for the end of the week. We should try harder to obtain access. * The facilities were acceptable but no more than that. Encouraging TP to plumb in the washing machine, as well as refurbish the showers (and air the White House), would make a considerable difference. * One athlete, who hadn't done much night-O, found launching straight into a mass-start race rather daunting and would have preferred some less pressured night training first, even though the night race had been carefully designed to avoid people being out alone. She actually suggested swapping Crathes and Templars Park but that would have meant using the more difficult area first -- probably not a good idea. Instead, I'd recommend a night map walk at TP for the newbies. * Abandoning the 'fun relay' on Friday was a good decision -- too many excessively tired people. One athlete commented on Friday that the mix of the week had been good though, with the right number of races. * Wednesday turned into a very long day, with much driving. Attending the evening event was a nice idea but I felt that we were imposing on the locals (especially as more or less everyone else had finished when our group was only just starting) rather than reaching out to them. Welcoming the MAROC athletes on some of the other days was good though. * As usual, a 'can-do' attitude prevailed and I would be happy to work again with any of the coaching (and cooking!) team. * possibly an overall balance with too much pairs/groups/trains cf. solo O? The kitchen was great although minus 2 important implements- a decent knife and a pair of scissors. Great supply of pans. Good fridge and a freezer. The groups tasks did not really work from my point of view. Expecting them to clear the tables and to wash, dry and put away was a tall ask. In the morning there was lunch stuff to clear and wash as well. Perhaps one group for laying up and clearing, one for wash/drying. The kids were not brilliant at turning up to do their jobs, especially the boys. Most meals I had to send for at least one of the boys. Not very fair on those who did appear on time. As a cook I found it very hard work. I like to cook everything from scratch so there is a lot of cutting, slicing and chopping to do. By the end of the week I had RSI in my right hand. It would have helped to have an assistant who could help with these tasks and/ or do the shopping. It was taking half an hour to do the trip but going round was taking anything up to 90 minutes. Unloading and putting away took at least another half an hour. Two days I could not get the car through the barrier. Seven trips up to the hut with heavy shopping bags is very tiring! By the time I had eaten I was already having to start preparation for the evening meal! I had some help from some of the junior coaches, ie Jonny, Mark and Charlotte doing the BBQ, which was really great. Timing was not always great. The evening of the BBQ the meal was nearly two hours after we'd been expecting it. Equally later in the week when there was an afternoon indoor coaching session which meant they were 20 minutes late eating. This meant the rice was ruined. Incidentally the kids voted with their feet that night and did not eat all the food. Despite this I enjoyed the week. But in future I suggest a second person to help. David would have been happy to have come. 30 is a lot to cater for. I really admire Liz Orr if she did it on her own. I would be happy to come again on a Scottish year. I was surprised there were not any older female coaches. I fell it is important for the girls to have an older woman who they could go to if necessary. Notes/night Travel from Inverness area; Possibly go swimming? Site activities? Night O introduction on site (one man/peg relay?) Night at Crathes (send maps to Fiona Milne in advance) Countesswells summer series event? (each individual states how will use as training) Write tour reports, hang tomorrow Party :) Tour reports ctd? Orienteering Activities ideas Reflection on 6 days maps/performances, shape/theory of the week, classroom leg planning sessions/games Pairs alternate legs planning; unlimited time map memory; “Norwegian” with map excerpts for the next leg at each control; talk O Straight lines of shape (paths removed); hanging (three similar courses with clusters of confusable features); following line; control flow or relocation (pairs exercise with only odd / only even controls shown); speed control (short legs, slightly longer legs, sections of line) Head to head; gaffled things; palmer challenges; trains; group terrain intervals along a line Orienteering intervals/loops/trains/in sight/pressure; lots of fun mini competitions; short exercises; obligatory stand for 10s at each control reading map? Scotly: Avoid rough open areas within the wooded bits; large green patches are completely unusable. Middle section in the East leading to W for classic? Consider duty groups as outlined in Mary’s feedback; welcome the idea of having 2 chefs. It would also be good to have more than 1 person doing all of the tour managing and leading the coaching. Otherwise some tweaking based on the contents of this doc, but nothing major that needs to be changed/actioned – except to ensure that we take a tour group photo for the website! After the Scottish Six Days, I was excited about the fact that I had been picked to go on the JROS (Junior Regional Orienteering Squads) tour for M and W16s - which this year was being held in the Deeside area (near Aberdeen). We arrived the day after the Scottish Six Days finished - having stayed over in a village hall near the last day in Glen Affric. We were then assigned into groups of 5 and spent the rest of the day getting to know our team. That evening we did some “armchair orienteering” - which was planning what routes we would take if we were going to run a set of courses. This was the first part of the coaching strategy that we were going to practise over the next week - the “plan” part of PDP (plan, direction, picture). The next day’s training was at Cambus O’May - a lovely Scottish area with plenty of complex contour and runnable forest. Our focus for this exercise was on “plan” and “direction” - making sure that when you leave a control you know what direction the next control is in and how you’re going to get there (or at least the first part of your plan). The next few days training was incorporating the “picture” element into this model and trying to use it as a whole in race situations. We had a night “peg relay”, where the aim is to get to each control first to get one of the limited number of clothes pegs there. However, there is a catch - if you take a peg you have to do an extension loop before going to the next control! This was great fun, but also was very useful as a pressured situation to practise some of the training concepts in. We also did a night race at Crathes - a local area, which was good up until the point where my torch battery fell off and I had to be rescued by some of the other athletes! Unfortunately on the second to last day I hurt my ankle and wasn’t able to take part in that afternoon’s training. This also meant I couldn’t do the tour champs race the next day, I just walked / jogged round the first section. Despite this, the tour was absolutely amazing. My orienteering has improved dramatically, and various talks (some from GB athletes) have helped me to structure my physical training as well. I would like to say a huge thank you to all the volunteers who helped to organise and run this tour, and to everyone whose generous support allowed me to take advantage of this great opportunity. NB This training map shows an exercise that we did at Birsemore called “Hounds and Hares”. The “hares” went first and put out the controls, and the “hounds” had to try and catch them while collecting the controls in - the last hound to each control had to take the control. 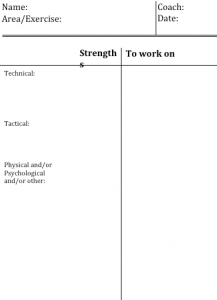 This exercise was great fun but also made you think fast under pressure. The camp will run from Saturday 8th August – Saturday 15th August 2015. The camp will be for the order of 20 athletes, the final number being determined by the Selectors and the Team Manager. Standard for selection: Athletes will be selected in increasing percentage of time behind the winner in each of the above races as averaged over their best three results in the above races. The selectors may choose not to fill all available places. The tour athletes will be selected by Susan Marsden (Chair), Pauline Olivant and Sue Roome. All cases of illness or injury which may affect an athlete’s ability to compete in one of the above selection races should be notified in writing to the athletes Regional Squad coordinator prior to the running of that race, clearly explaining the reasons for their failure to compete. The Regional Squad Coordinator will make the Selectors aware of such notifications.